Preaching is not just for preachers. Every Christian can, and, I’m increasingly convinced, should be educated about the task and calling of the preacher. I am convinced that there is great benefit in all Christians becoming students of preaching. This applies even to those who will never stand behind the pulpit and bring the Word of God to His people. 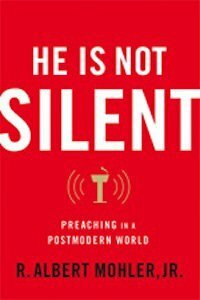 The book I would recommend to laypersons wishing to learn about preaching and to pastors wishing to learn how to preach better, is Al Mohler’s He Is Not Silent. Just released by Moody Publishers, this book is a brilliant and insightful look at the task and challenges of preaching in a postmodern world. It is not a how-to guide and is not a dry exhortation valuable only for those with theological degrees; instead, it is a compelling, winsome, biblical case for understanding the utter centrality of preaching to Christian worship. This postmodern world has lost its respect for preaching. Once regarded as the center of Christian worship, preaching is now seen by so many Christians as something that is supplemental instead of instrumental. In the Foreword to this book John MacArthur writes, “One of the clearest lessons we can learn from church history is that strong biblical preaching is absolutely vital to the health and vitality of the church. From the birth of the New Testament church until today, every significant phase of authentic revival, reformation, missionary expansion, or robust church growth has also been an era of biblical preaching.” Indeed, from the church’s earliest days to the Reformation, through revivals and awakenings, it is always preaching that has been the tool God has used to call, draw, change and revitalize his church. And in the face of history’s testimony, “it is remarkable that over the past half century (or longer) evangelicals have devoted vast quantities of energy and resources to the invention of novel church-growth strategies that tend to discount biblical preaching.” We have taken our eyes off Scripture and off the testimony of history. Mohler begins his examination of preaching by discussing the state of preaching in our day, turning to Dickens and his famous words, “It was the best of times, it was the worst of times.” Though there are signs of great promise and though many Christians are renewing the emphasis on preaching, there remain thousands of churches where the preaching of the Word is minimized or forgotten all together. Mohler offers six factors which together have contributed to undermining the role of preaching in the church and to define it as something other than the exposition and application of the biblical text. Here we see how the world has invaded and shaped the church. Having set the stage, Mohler puts preaching in its proper context at the very heart of Christian worship, looks to the Trinitarian nature of preaching and then defines true, biblical preaching as being expository in nature. After a chapter defining this type of preaching, he looks to the preacher’s authority and purpose, to the importance of preaching the Bible’s big story and to the importance of every pastor being a theologian. The book wraps up with a look at the particular challenges of preaching to a postmodern culture, with an exhortation to preachers about the urgency of their task and an encouragement to preachers drawn from the ministry of Ezekiel. An Epilogue provides a brief biography of Charles Spurgeon and discusses his contagious passion for preaching. This is a book that will challenge and, I hope, shape many pastors. I cannot imagine the pastor would could not derive some benefit from it. Mohler, a great preacher in his own right, is passionate about this topic and speaks as a preacher to other preachers. If you are a pastor, read this book! You will find it a source of great wisdom and great encouragement. But, as I indicated a short time ago, I think it is also an ideal book for all Christians to read and absorb. Let me illustrate this way. If you were to commit to going to a baseball game at least once per week for the rest of your life, I suspect you would want to understand the sport. Though you would always know that you would never be out on that field, you would still want to know what makes a great player great; you would want to understand how a pitcher faces a batter and attempts to outwit him with a mixture of pitches, speeds, breaks and locations; you would want to see how a manager attempts to set the perfect lineup to face the opposition. Without such knowledge you would not fully understand the game and would not derive as much pleasure and benefit from it. What you take from the game is in many ways contingent on your understanding of it. In the same way, understanding preaching will help the Christian in many ways. He will know what kind of preaching he should expect and what kind of preacher to seek out; it will give him new respect for the preacher and for the difficulty and uniqueness of the task; it will give him reason to praise God for His gift of preaching and preachers. As Dr. Mohler writes, “A theology of preaching begins with the humble acknowledgment that preaching is not a human invention but a gracious creation of God and a central part of His revealed will for the church.” Of course he must read carefully and humbly, knowing that his preacher is imperfect and prone to sin. But his understanding of preaching will teach him how to listen, when to listen and why he must listen to the preaching of the Word. This is the third book from the pen of Dr. Mohler we’ve seen in 2008. In my view, it is the best (at least of the three I have read to this point). Though Mohler aptly addressed culture and new atheism in his previous two titles, there is a new kind of passion in this book. Mohler calls for the “re-centering” of an element of worship that has been pushed to the periphery. He does so with confidence based on Scripture and in a way that can appeal to any reader. Buy it, read it, and while you are at it, buy a copy for your pastor. Here are a few quotes I culled from the book–a few of the many notable quotes.